As the Cairo Opera House celebrates its Silver Jubilee on 10 October, Ahram Online traces the quarter-of-a-century history of this home to the Egyptian arts. n Thursday 10 October, the Cairo Opera House celebrates its Silver Jubilee. The day marks 25 years of activities in the institution that opened its doors some 17 years after the great Khedivial (Royal) Opera House tragically burned to the ground on 28 October 1971. 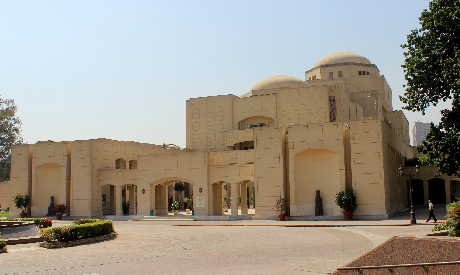 Built with the support of the Japan International Cooperation Agency, the new Cairo Opera House (National Cultural Centre – NCC) was inaugurated on 10 October 1988. The opening night, attended by dignitaries and public figures of the time, was marked by an outstanding ceremony which featured a Japanese Kabuki performance. It is worth noting that the new Cairo Opera House was the first venue in Africa and the Arab world to stage such a traditional Japanese theatre performance. 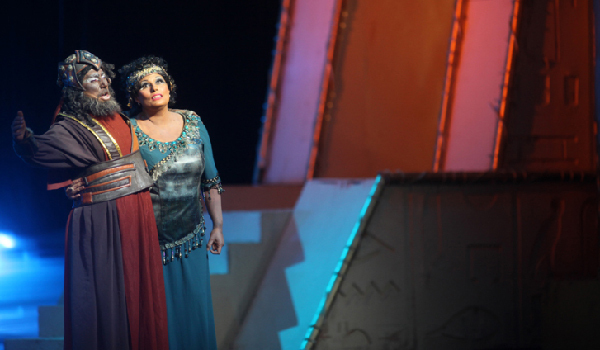 The operatic history of Egypt is 150 years old, touching the days when Giuseppe Verdi composed the famed opera Aida. Today, replacing the area which served as exhibition ground until the late 1980s, the crème-coloured new building standing in Cairo’s Zamalek district also has tales to tell about its quarter-century-long history. 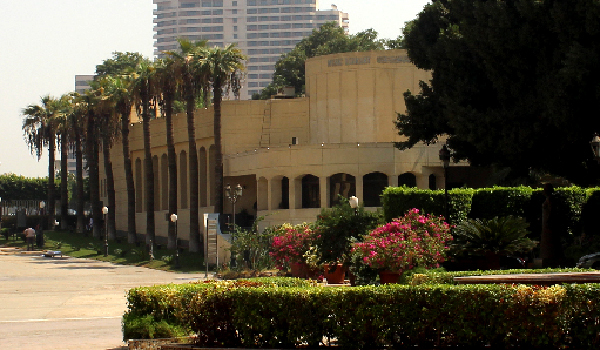 The National Cultural Centre’ main building is the Cairo Opera House – home to music and dance performances – and expands to house a number of galleries, museums and quarters for educational programmes. The Opera House’s main hall, designed to seat 1300 spectators, lends its stage to symphonic concerts and performances; the small hall (350 seats) and open air theatre present recitals, light music concerts, cinema clubs, artistic salons and special performances. Magda Saleh, the former prima ballerina educated in Egypt, Moscow and New York, served as the Cairo Opera House founding director during its construction phase. Ratiba El-Hefny assumed the position upon the opera’s opening and start up of actual activities until she was replaced by Tarek Ali Hassan in March 1990. Though home to valuable documents, the library halls unfortunately remain vacant on most days, with some visitors complaining of misinformation concerning opening hours and logistic details. This, however, does not detract from the main mission and the many gems that the library, “lost in time”, can still offer. It is quite apparent that the years under Nasser El-Ansary’s directorship – due to their length (1991-1997) and positioning both in the history of the Cairo Opera and Egypt’s culture – were infused with particularly high dynamism for the institution, which spread wide to reach audiences even beyond the opera building itself. Internationally-celebrated names continued to grace the opera’s stages: Ballet of Opera Varna and the Sofia International Opera (Bulgaria), the New Classical Ballet (Moscow), the Dance Theatre of Harlem, the Renato Greco Contemporary Dance Company (Italy) and the Stockholm Youth Symphony Orchestra (Sweden) were among the first to visit the new opera’s stage and perform to Egyptian audiences. 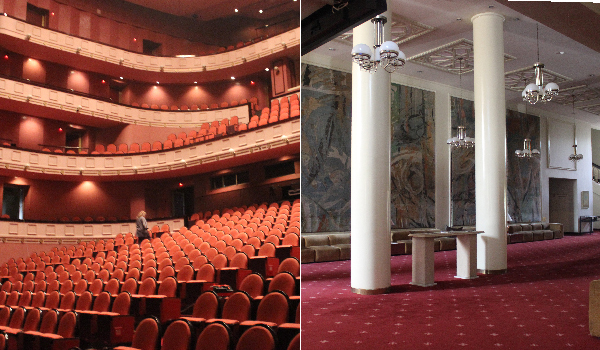 The global exchange was reflected through several developments inside the Cairo Opera. In 1992, the Cairo Opera Dance Theatre Company was launched, performing contemporary dance with Walid Aouni as choreographer and artistic director. Two years later, the Cairo Opera Orchestra was founded, becoming the second national orchestra under the Cairo Opera’s umbrella. The Opera House also brought to life in 1994 the first mega production of opera Aida in Luxor, marking one of Nasser El-Ansary’s most significant initiatives. The years between 2004 and 2012, during which Abdel-Moneim Kamel was chairman, are characterised by a budget that allowed many international troupes to perform at the opera, while Kamel’s large network of contacts in the field facilitated the exchange. Despite the countless flashy names that crossed the opera stage at the time, alleged administrative gaps were posing a challenge to the opera’s link with the different social strata. In fact, even prior to Kamel’s directorship, remnants of the Samir Farag times – halted university concerts, interrupted television broadcasts, reduced advertisements – had been reflecting on the artists themselves, discouraging many. At the same time, according to commentators, the opera’s artistic dynamics began to increasingly intertwine with a net of non-artistic priorities. Abdel-Moneim Kamel’s annually-renewed contract ended in February 2012, when he was replaced by Ines Abdel-Dayem – whose chairmanship of the Opera House was suddenly and inexplicably interrupted by her dismissal (May-July 2013) at the hands of former minister of culture Alaa Abdel-Aziz, appointed by then Islamist president Mohamed Morsi. The dismissal was coupled with a number of decisions and policies implemented by Abdel-Aziz which caused the wrathful artistic community to accuse him of allegedly “Brotherhoodising” culture – in reference to the then ruling Muslim Brotherhood from which the president hailed. Between 28 May and 14 July 2013, Badr El-Zakaziky served as opera director under complicated circumstances: not only was June heralding the end of the opera season but also, and more importantly, those days were marked by a series of artists’ protests and sit-ins against Abdel-Dayem’s dismissal. Abdel-Dayem was reinstated in July by the new minister of culture, Mohamed Saber Arab. Returning with new energy, Abdel-Dayem hopes to infuse the opera with dynamic activities, reaching with arts and music to the “forgotten” layers of the audience, even spreading beyond the cosmopolitan cities of Cairo and Alexandria to other governorates. Her task is not easy, considering the budget limitations which already crippled her directorship since February 2012. Against the odds, however, Abdel-Dayem opened the opera’s doors to many new artists, including independent troupes who, in turn, attracted new and younger audiences. Equally well, Abdel-Dayem managed to navigate the opera’s activities through probably the most challenging year in the history of Egyptian culture, when the Muslim Brotherhood were in power. 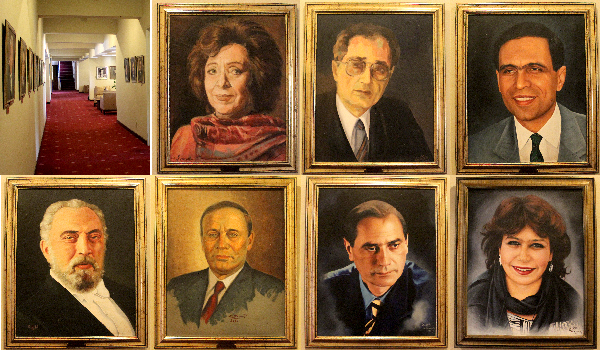 On Thursday 10 October, during the Cairo Opera House celebration of its 25th anniversary, all its former chairpersons will be honoured for their contribution to the opera’s artistic development and Egypt’s culture. The detailed programme of the celebrations is yet to be announced.